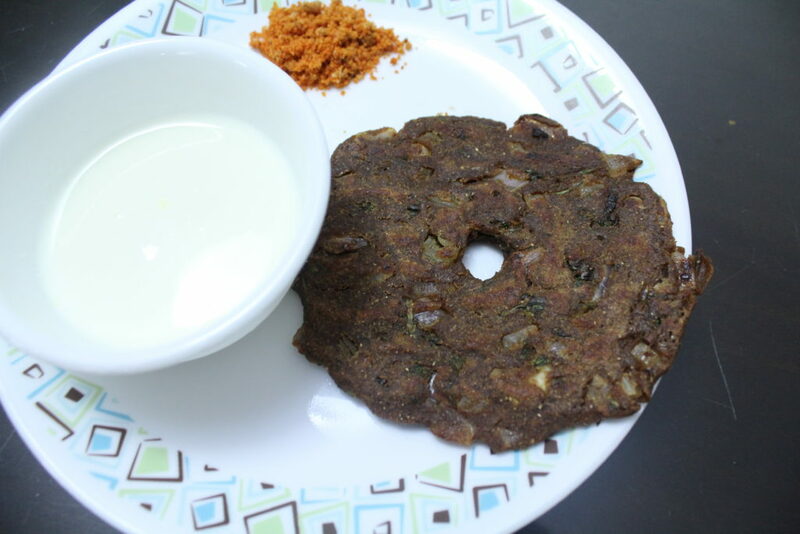 Thalipeeth is a savory pancake and a popular Maharashtrian breakfast item. We, many a times, have it for dinner as well. It is a very nutritious dish with a variety of grain cereals and pulses ground together. Bhajni (meaning: roasted) is the flour used to make thalipeeth. The recipe for bhajni is given below. Once the bhajni is ready, it can be stored for months together, preferably in an air-tight container to retain its fragrant aroma. Dry roast all the items individually on a slow flame and grind it together to a fine powder. Store it in a cool, dark place. I sometimes keep it in the freezer by sealing it in a Ziploc. It stays good for around 4-6 months in the freezer. Mix all the above ingredients in a mixing bowl and make a pasty dough. Once the dough is ready, slightly grease/wet your palms and flatten the dough ball onto a wet plastic sheet/butter paper into a round pancake. It is important to wet your palms and the plastic sheet so as to avoid the sticking of the dough to your hands or to the plastic. 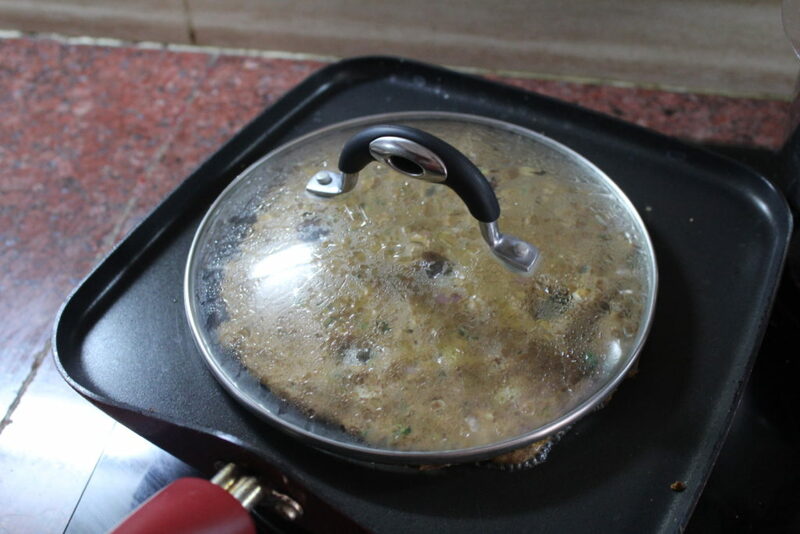 Now carefully lift the thalipeeth off the plastic by turning it upside down onto the heated griddle. Sometimes, I even flatten the dough ball into a pancake directly on the griddle by sprinkling water which helps me spread it evenly. Keep the heat on moderate to allow it to cook evenly. 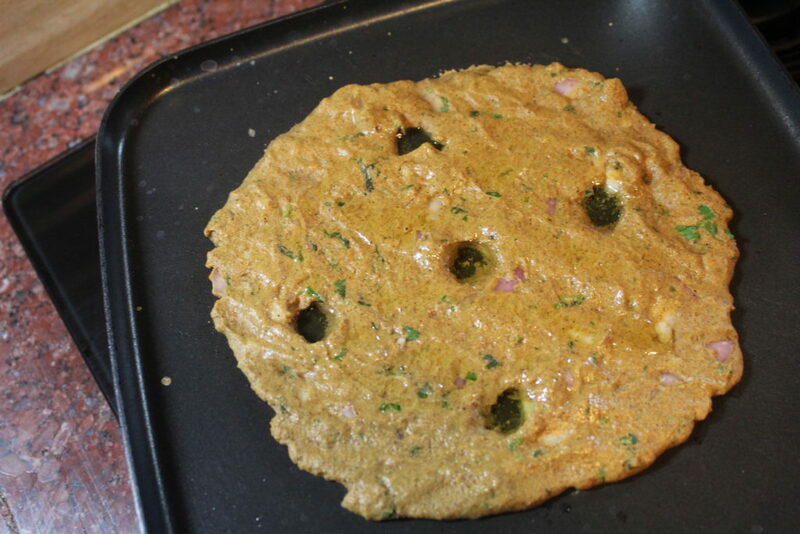 Thalipeeth is a thick pancake and needs to be cooked on moderate heat/flame to allow its even cooking. Form holes on to the thalipeeth with your fingers. This helps in cooking it evenly. Drizzle a few drops of oil on the sides of the thalipeeth and in the holes to shallow fry it. Cover the thalipeeth for a few minutes with a lid. Flip over the thalipeeth and cook it on the other side as well. Your crispy thalipeeth should be ready soon. In my mom’s house, it is usually served with a dollop of home-made fresh butter and a side of mango pickle. I like it with curds and my husband and son enjoy it with desi ghee. Tip: You can also add vegetables of your choice to thalipeeth such as grated carrots, cucumber, methi, spinach to give it that extra vitamin punch!